The Rangers are 32-18-6. Last year, after 56 games, they were 34-16-6. That team went on to win the Presidents’ Trophy, finishing with 113 points. So for as bad as the Rangers were from Nov. 25 through Jan. 17, going 8-13-3, they aren’t really much different than they were at this time last year. The only real difference, even though it’s not necessarily a difference yet, is that the 2014-15 Rangers got to 113 points and earned the No. 1 overall seed in the playoffs with a 16-2-2 record over a 20-game stretch from Feb. 10 to March 22. I don’t know if the 2015-16 Rangers are capable of that kind of run, especially without Ryan McDonagh and Rick Nash, and they most likely aren’t, but it’s still possible. In reality, the Rangers don’t need to go on that kind of run. As we saw last season and have in most seasons, aside from actually receiving the Presidents’ Trophy, possibly hanging a non-Stanley Cup Champions banner and potentially hosting a Game (which doesn’t guarantee anything), being the overall 1-seed or the 1-seed in the Eastern Conference doesn’t necessarily get you to where you want to go. All I care about is that the Rangers get in the playoffs and it doesn’t matter how. But it does matter who they play. Last season, starting with 25 games left in the season, I wrote the Scared of the Rangers Playing Them in the Playoffs Power Rankings and I updated it with 12 games left. Now that it looks like the Rangers are going to the playoffs, it’s time to figure out which teams to root for them to play. After the Rangers blew a 3-1 series lead to the Capitals in the 2008-09 playoffs and then were embarrassed in five games in the 2010-11 playoffs, I didn’t think they would ever beat the Capitals in the playoffs, much like the Penguins. But those were different teams and a different time and the way the Rangers overcame the Penguins in the playoffs last year, they overcame the Capitals in the 2011-12 playoffs. Since then the Rangers have won two series against the Capitals and two Game 7s. A series against the Capitals means the Rangers will play another series after it. The Rangers did end up playing the Capitals, saved their season with 1:41 left in Game 5, overcame a 3-1 series deficit and won another Game 7 against the Capitals. But the way things changed from 2010-11 to 2011-12, they could easily change in 2015-16, and I don’t want to have to find out. In all likelihood, the Rangers will be the 2- or 3-seed in the Met and if they win their first-round series, they will have to play the Capitals in the second round. That is, unless the Capitals are upset by a wild-card team. Let’s hope whichever team gets the second wild-card seed does so by being the hottest team in the league down the stretch and carrying that momentum into the first round against the Capitals. It would make things a lot easier for the Rangers. Last season, I didn’t want anything to do with the Islanders in the playoffs even if for two weeks it would be the most intense non-conference finals or non-Final series the Rangers have ever played. Then I changed my mind and wanted a Rangers-Islanders series, but we didn’t get it. Now I’m against it again. The Islanders play the Rangers harder than anyone in the league, outside of maybe the Devils, and there’s no question a potential Rangers-Islanders series would go the distance. The Rangers would have everything to lose in a series against the Islanders since they’re supposed to win and if they were to lose, it would be much like the Yankees losing a playoff series to the Red Sox: a disaster. Not only am I scared of the Rangers losing to the Islanders and having to listen to their insufferable fans, but I’m scared that a Rangers-Islanders series would take everything out of the Rangers and leave them exhausted for a second-round series against the Capitals, much like what the 2003 ALCS did to the Yankees. It was painful to watch Ryan Callahan, Brian Boyle and Anton Stralman be on the winning side of a post-Game 7 handshake in last year’s Eastern Conference finals, and it would have been unbearable to watch those three hoist the Cup in the year following their departure from the Rangers. While I’m over the devastation that comes with watching the team’s former captain and my former whipping boy beat the Rangers in Game 7 at home for the first time in franchise history, I’m not about to watch it happen again. The Rangers easily handled the Penguins in five games last postseason, a year after overcoming a 3-1 series deficit to get Dan Bylsma fired. Since then, the Penguins hired and fired Mike Johnston and made former Rangers assistant coach Mike Sullivan their head coach. The trade of Phil Kessel hasn’t done what many thought it would, and after going missing for the first half of the season, Sidney Crosby has return to his old self playing for Sullivan. Like I always say when it comes to the Penguins, it’s hard to say you want to play a team that has the best player in the world and at times the second-best player in the world on the same team. But in recent years, the Rangers have owned the Penguins, both in the regular season and postseason and once again this past week, the Rangers displayed that dominance again with a 3-0 win without their best offensive player and best all-around defenseman. I think all Rangers fans are hoping the Devils start to play the way a team with their roster should play down the stretch here. The Devils seem to have the Rangers’ number and with an elite goalie in Cory Schneider and the Devils’ ability to score garbage goal after garbage goal against Henrik Lundqvist, it’s not a matchup I welcome. I should be jumping at the chance for the Rangers to play a team led in scoring by Lee Stempniak, but I’m not. I want no part of the Devils. The Rangers haven’t played the Red Wings this season, so it’s hard to say the current version of the teams match up. I know last year I wasn’t scared of playing the Red Wings and I’m still not. I’m actually very anti-Red Wings because of the way they blew their first-round series against the Lightning in the playoffs last year. The Red Wings held a 3-2 series lead over the Lightning before losing 5-2 in Game 6 and 2-0 in Game 7. The Lightning went on to beat the Canadiens in six games and then played the Rangers and beat them in Game 7 at MSG. If the Red Wings finish the job at home in Game 6 against the Lightning, the Rangers end up playing the Red Wings or Canadiens in the Eastern Conference finals and most likely (obviously there is no way of knowing, so I’m going to side with the Rangers here) would have reached the Stanley Cup Final. Eff you, Detroit. In 2010-11, the Bruins won the Cup. In 2011-12, they lost a first-round Game 7. In 2012-13, they went to the Final and lost in six games. In 2013-14, they were the 1-seed in the East and the best team in the league, and blew a 3-2 series lead to the Canadiens in the second round. In 2014-15, they lost their last three games and missed the playoffs by two points, and then fired their general manager and traded Milan Lucic, Doug Hamilton, Carl Soderberg and Reilly Smith. The Bruins have rebuilt on the fly and done a decent job at it. The Bruins still aren’t very good, but could sneak into the playoffs and finish as high as first in the Atlantic or as a wild-card team. They’re not the force they were two and three years ago, but they still scare me and appear to be a bad matchup for the Rangers. The Panthers find themselves in this spot only because they are somewhat of an unknown when it comes to playing the Rangers. It’s hard to get a real read on how the Rangers play against the Panthers because their games against them are so wildly inconsistent. 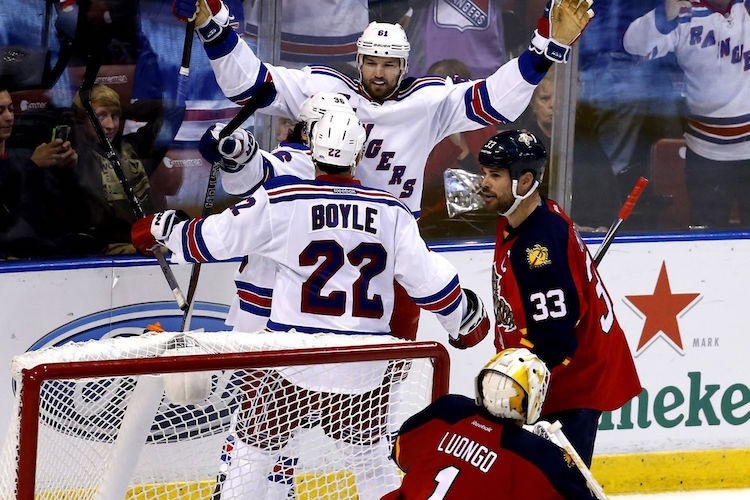 In November, the Rangers won 5-4 in overtime at MSG. In January, the Panthers won 3-0 in Florida. Last season, the Rangers swept the season series, winning 5-2, 6-3 and 2-1. Since this is the first good season this Panthers group has had together with the team’s last playoff appearance coming in 2011-12, it’s hard to get a feel for how good this team is if they’re even good at all and how they play in the postseason. Their abundance of former Blackhawks and presence of Dale Tallon scares me a little, but not enough to not want to play them in the playoffs.